« Unable to create Tech Support file for UCS Manager – workspace partition is full. The EMC® Ionix™ Unified Infrastructure Manager/Provisioning Service Adoption Utility is used to adopt services on VCE Vblock™ Infrastructure Platforms that were not created using EMC® Ionix™ Unified Infrastructure Manager/Provisioning (UIM/P). Once discovered, these services are adopted and managed by UIM/P. The Service Adoption Utility also is used to edit services and to generate reports summarising the storage, network, and zoning resources in a service. UIM/P SAU has been available as an installable RPM module in UIM/P 3.0 and since version 3.2 is integrated with UIM/P virtual appliance. UIM/P 4.0 is now available and includes many new features and bug fixes. Even if you have had any doubts or reservations about using UIM/P, after using UIM/P 4.0 you will not have any. It is really good! Before we begin, please go through the ‘Vblock/VPLEX Prerequisites‘ and general guidelines on ‘What Makes a Service Adoptable‘. There are also several additional points I would like to make which will help you to prepare to adopt the services and successfully synchronise them. What type of LUNs are presented to the hosts: VMFS, RAW/RDM, Replicated? What are the host’s IP addresses? Can UIM/P resolve host names? Do as much housekeeping as possible! Imports zones and adds them to the existing zonesets. Storage volumes are identified and added to UIM/P storage pools. Service profiles are imported into UIM/P. A managed service is created in UIM/P. An existing service offering can be used if it passes validation. If no existing service offering can be used, a new service offering will be created from the structure of the service. After the service is successfully adopted, you can use both the UIM/P API and the Unified Infrastructure Manager/Provisioning console to manage the service. My test environment consists of one UIM/P 4.0 virtual appliance that manages two Vblocks (DC1 and DC2, each in a separate data centre). The Service that I am going to adopt is a two two-node clusters (one in each datacentre) with 5 x 1TB non-replicated and one 1TB replicated LUNs. The services have been built and configured by the old UIM/P 3.2 which managed each Vblock individually. I would also like to have one Service Offering (instead of two like in the old configuration with two UIM/P VAs) that will cover this type of Service. This SO must contain only the bare minimum Service configuration to simplify any new Service deployment. Disclaimer: For the purpose of this guide, I slightly mis-configured the services to demonstrate how all components fit together… In real life…, please, please do the housekeeping. Select a Converged Hardware System and click Find Services. On the right hand side you will find ‘Vblock/VPLEX Prerequisites‘ and ‘What Makes a Service Adoptable‘ I mentioned before. From the list on servers discovered on the Vblock Converged Hardware System select servers that you want to import into UIM/P. “At the adoption stage, they will be consolidated into clusters based on shared data storage volumes. If they do not have shared storage, they will end up as standalone servers. There is an option to “Adopt selected hosts as a “host only” service.” If this box is checked, the selected hosts will be combined into a “host only” service containing no data volumes. That is, only boot volumes will be adopted into the service. This is required for adopting Standard Services that will be attached to a VPLEX Shared Storage Service. Create a new or select existing Service Offering. If a service offering was selected in the Service Offering Name drop-down list, the selection is validated against the current constraints and resources that are available for use for that offering. As you can see, the data LUNs have different Tiering Policy configuration. In UIM/P SAU 3.2 this would not make any difference, SAU would associate these LUNs with DEV-VMFS-R5 Storage Pool and corresponding Storage Grade. SAU 4.0 is FAST VP policy aware and therefore when it adopts this service, it will create Service Offering with three FAST_VP_policy-based Constraints AND Defaults. Please make sure it is how you would like to configure the Service. 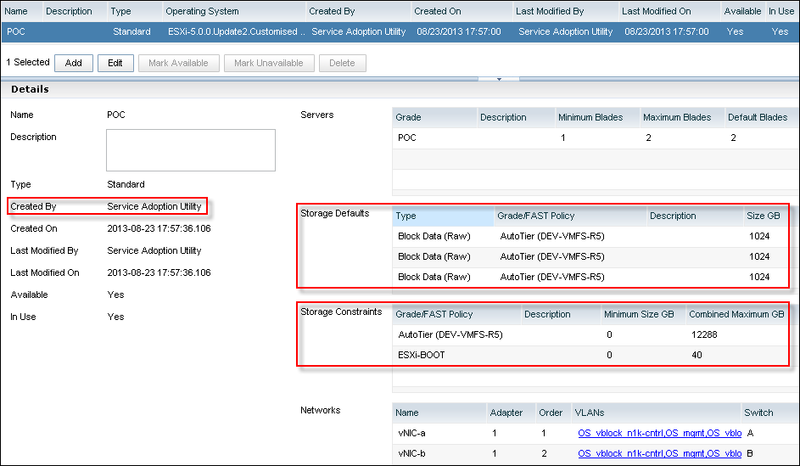 If not – amend the configuration, re-discover Vblock and run Service Adoption Utility again. You might also consider to subscribe to this well known publication. You need to re-discover Vblock in UIM/P for these changes to be visible to UIM/P. OK, the Service has been adopted. Lets have a look how the Service was configured. Go to UIM/P Administration interface and check the Service configuration. You will notice the ‘Synchronize’ button is greyed out. Edit the Service, go to vCenter Cluster tab and configure vCenter, Datacenter, DRS and HA settings. Combined Maximum has been calculated based on the fact that there are two hosts with 6 x 1TB LUNs in this cluster. 2 x 6 x 1024GB = 12288GB. This again is not what the real storage limit I would like to set for this Service Offering. Delete the Service Offering that was created during Service adoption and then create a New Service Offering from scratch. 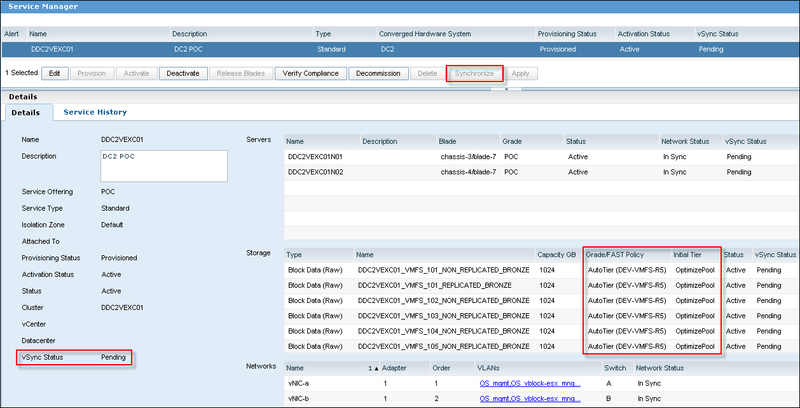 Please refer to “HOW TO: Configure a new Service Offering in EMC UIM/P” article for details. You need to re-run SAU and re-adopt the Service and link it to the “Existing Service Offering”. Both options look very similar, and both take roughly the same amount of time to complete. I think, the biggest difference is that Option 1 is less prone to errors in Network configuration as it adopts existing Network configuration comparing to manual configuration. IMPORTANT: Click the Unmanage Service button with extreme caution. This process removes the service from the UIM/P database. Unmanaging does not alter the actual Converged Hardware System hardware; it just removes the service from being managed by UIM/P. After the process completes, the service will again be adoptable using SAU. There is no guarantee that if you unmanage the service here, you will be able to re-adopt it using SAU. Login to UIM/P. Open Service Manager, make sure the Service is no longer listed. In Service Offerings, highlight the SO that deleted Service was based on and click ‘Mark Unavailable’. You can now edit the Service Offering according to your requirements and publish it in Service Catalog by clicking ‘Mark Available’ (overwise it will not be available in the “Existing Service Offering” drop-down menu in SAU). We can now go back to UIM/P administration interface and edit the Service’s. 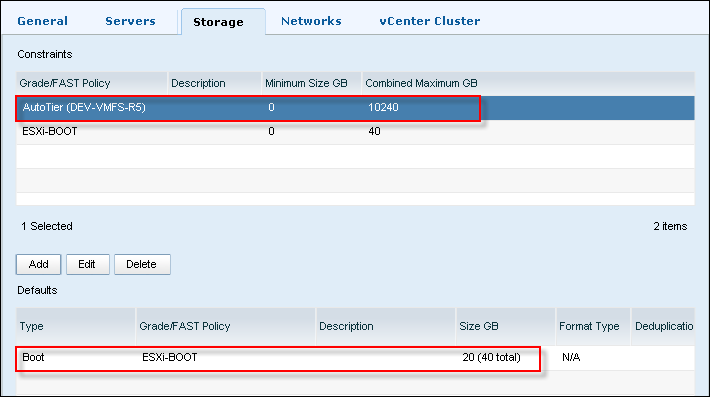 Configure vCenter Cluster configuration and other things described in step 11. Follow the same steps to re-adopt the cluster from the other datacenter. Make sure you select the same Existing Service Offering and correct vCenter server. What about Shared Storage Service? Please stayed tuned, I am working on the article and will publish it as soon as it is ready. Please subscribe to the RSS feed, Twitter or via email. Required: Vblock platform (VPLEX platform) is in a “Discovery Succeeded” state in UIM/P. Required: Both Vblocks associated with the VPLEX are in a “Discovery Succeeded” state in UIM/P. Required: Vblock(s) platform has passed setup validation with a “Ready” or “Warning” result. Storage pool has been assigned a UIM/P storage grade. This is also applicable to Raid Pool 0 (RAID Group 0) – storage RAID Group where host boot LUNs are created. Really easy to miss. 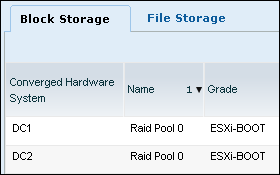 Storage pool has been marked “available”. Storage pool RAID Level has been set. FAST Policy Default Initial Tier has been set. In my environment it is only applicable to NoMovement FAST VP Policy. FAST Policy has been marked “available”. Required: The service is confined to a single Vblock platform. Required: An isolation zone must be created in UIM/P with the same VSAN id as is configured for the service(s) intended for adoption. If you intend to adopt file storage volumes, the isolation zone should be configured to include an NFS VLAN and NFS IP Pool. Required: The UCS VSAN names match the SAN Switch VSAN names for the same VSAN ids. Vblock platforms must be a Cisco® Unified Computing System™ (UCS), one storage array, and two SAN switches. UCS must use SAN boot and no local storage. Recommended: Identity pools (UUID, WWNN, WWPN, and MAC addresses) have been created in UIM/P. Recommended: Blade Grades have been created in UIM/P (for association during adoption). Recommended: vCenter and vCloud instances have been configured in UIM/P and enabled. Recommended: Operating System ISO images have been installed into Homebase. Optional: Service Offerings have been created to match your existing services (this is optional because Service Adoption Utility can automatically create a Service Offering for you that exactly matches your configuration). All blades in the service should be of the same Cisco UCS Blade model. Servers cannot use UCS service profile, vNIC, or vHBA templates. You can unbind the templates easily in the UCS manager. Each server in a cluster should have the exact same vNIC configuration across servers. That means they should have the same number of vNICs, the same vNIC names across servers, and each relative vNIC should have the same vLANs configured. On EMC CLARiiON™-based Vblocks, there should be a storage group for each server which includes both the boot LUN and all shared data LUNs. On EMC Symmetrix™-based Vblocks, there should be a boot masking view for each server with a single boot LUN and both server host initiators. There should also be a single shared masking view which includes all the host initiators and shared data LUNs for the whole cluster. All servers should recognize the exact same shared data volumes – no fewer, no more. Every server should have 2 vHBAs. Every server must have identical vHBA configuration. Every server must have exactly 4 paths (zones) between the UCS and Storage Array (two per Fabric between each vHBA and array Storage Ports). Hi, we are facing the issue, after creation of the LUNS through UIMP. Even when we expand the Luns, the virtual machines which ware in the data stores when it will be rebooted, the data stores getting inactive. No sure I understand what the issue is… It may be a good idea to re-discover Vblock to check if UIM/P can connect to all components and synchronize vCenter to confirm all changes to the Service have been applied to the hosts. Well, this maybe part of the issue. You need to check IP addresses and logon details for all Vblock components: storage, Ethernet and SAN switches, UCS Manager and the vCenter. I see a Blade which is not properly decommissioned visa UIMP and so when I try reusing the blade it is throwing me a error saying no blades available . The current state on UIMP is ” in use : External ” . When I checked in SAU it shows the blade is listed under /orgOrg/root/lsServer/xxxxxxxx.com which no longer exists . I would like to delete this entry and start reusing this blade . Please suggest the procedure .